Lets you turn in both kinds of Pre-War Books to Scribe Yearling for the unmarked quest Yearning for Learning. ADDENDUM: Any works which use this mod must be properly described and categorized. Content from this mod is not permitted for use in mods whose descriptions omit or obscure major changes that they make. If you're like me, you hate how Scribe Yearling asks for any Pre-War Books you can find, but will only take one specific variety. The green ones, those are fine. The blue ones occasionally sold by Crazy Wolfgang, NOT GOOD ENOUGH. Look lady, these things aren't destroyed, and beggars can't be choosers, okay? 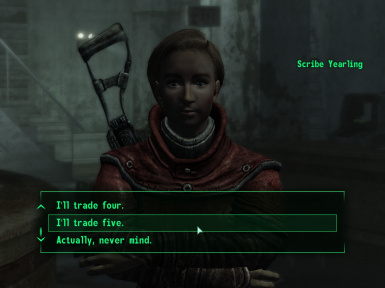 This mod alters Scribe Yearling's dialog so that she will accept "false"/blue Pre-War Books when you go to turn in books to her. 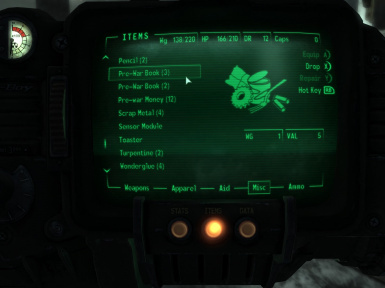 The "turn in X books" options will first take any green Pre-War Books you have, then take the blue variety. You will receive the appropriate credit for both. The "take all the books I have" option will take all of either variety and, again, give you appropriate credit for both. That's basically it. I make no claims that this will not horribly unbalance the game. I have made a special version for people who use the Brisa Almodovar companion, as the edits I've made directly conflict with that mod. You can find it in the Optional Files section. Use that version instead of the main one.